The summer break is fast approaching, and sign-ups for summer camp programs are already in full swing. Below are just a few of the options available in North Central Phoenix. Led by the Arizona Tennis Academy, the weeklong series of camps will be offered weekdays from 8 a.m. to noon starting June 2 through July 18 at the Pointe Hilton Squaw Peak Resort, 7677 N. 16th St.
Camps are designed for beginner to intermediate tennis players ages 6 to 17. Campers will enjoy tennis instruction from 8 a.m. to 9:30 a.m. each morning, followed by a half-hour snack break, then supervised swim time at the resort’s four-acre River Ranch water park which features a lazy river, water slide, sport pool, mini golf and more. Tennis instruction will be provided by the Arizona Tennis Academy and will feature exciting drills, games and quick-start instruction for beginners. Weekly sessions are available for $180 per week, with a 10 percent discount offered for siblings. For Super Summer Tennis & Swim Camp reservations, call 602-206-1550. For more information, visit http://www.squawpeakhilton.com/phoenix-recreation or www.arizonatennisacademy.com. 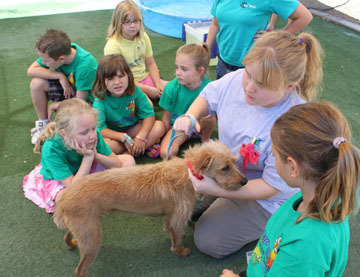 North Central teen Hollie Bowman, a junior camp counselor at the Arizona Animal Welfare League shelter, talks to a group of younger children about how to properly care for their dogs (submitted photo). offer active learning opportunities regarding a variety of animals and the care each animal requires. With a different topic to explore each day, campers acquire an appreciation for responsible pet care as well as an understanding of unique animals such as iguanas, cockatoos, sugar gliders and snakes. Through live animal interactions, camp participants learn training tips, animal care, behavior and proper handling techniques. AAWL is offering two different themed 2014 summer camps for kids ages 6-8. Camp Dates are: June 2-6, June 16-20, July 7-1, and July 21-25. • Puppy Power Camp—This fun and interactive camp explores the heroic side of our animal friends. From dogs who have lifesaving duties to hedgehogs with super protective powers we will experience the super side of our mighty animal friends! Camp Dates are: May 26-30, June 9-13, June 23-27, July 14-18, and July 28-Aug. 1. • Rockin’ Rescue Camp—Shelter animals often get a bad rap; the truth is rescue pets rock! Campers will interact with and learn about a variety of rescue animals from chinchillas and tortoises to puppies and kittens. During this weeklong experience our rockin’ campers will mix music and passion for animals to create a “Rockin’ Rescue” grand finale performance! AAWL also offers two different themed 2014 summer camps for kids ages 9-12. Camp dates are: May 26-30, June 9-13, June 23-27, July 14-18, and July 28-Aug. 1. • Intro to Camp Vet—If your animal loving child has dreams of becoming a veterinarian then this is the perfect camp to prepare your pre- teen for AAWL’s more advanced veterinary science camps. This career discovery camp introduces young minds to the basics of animal medicine. Through hands-on activities and live animal interactions campers will learn the basic of health care for both domestic and exotic pets. • Animal Training Adventure—Campers will learn all the key fundamentals of animal training and work hands on each day with a variety of animals. Our young trainers will work in groups of 2 to 4 to train shelter dogs and exotic pets over the wee long program. They will learn all the ins and outs of positive reinforcement training, how to use a clicker and timing of rewards while training. Camp dates are: June 2-6, June 16-20, July 7-11 and July 21-25. Full-day camp for children ages 6-8 takes place from 8 a.m. to 4 p.m. Fee for non-members is $275, and members pay $245. After Care is available from 4 to 5:30 pm. The cost is $50 for the entire week when paid in advance or $15 per day. A Half-Day Camp is available from 8 a.m.-Noon. Fee for non-members is $175, and members pay $155. Membership price reflects membership in the Jr. Paw Club membership only: https://aawl.org/jr-paw-club. Parents can go online to register at https://aawl.org/summer-camp or call 602-273-6852, ext. 1222 or ext. 121. Keep kids learning and having fun this summer at the Pueblo Grande Museum Hohokam Experience Summer Camp programs. The museum, 4619 E. Washington St., offers two weeks of hands-on Hohokam science, history, art, music, and archaeology classes to choose from for children of all ages. Register online through the Calendar of Events page at www.pueblogrande.com or at phoenix.gov/parks/classes now. • Archaeology for Kids Summer Camp (Course #104843), for children ages 8 to 13, 8:30 a.m.-Noon, Monday through Friday, June 9-13. Cost: $100 for the week. Experience the life of an artifact from archaeology to being displayed in a museum. Explore the science of archaeology by doing a simulated archaeological excavation of a Hohokam pithouse, learn how to identify artifacts in the field, and discover how archaeologists use these artifacts to learn more about past cultures. Once you’ve finished in the field, head into the research labs and collections storage of the museum to learn the science of caring for artifacts. • Art-e-ology, for ages 6 to 10, 9 a.m.-Noon, Monday through Friday, June 23-27. 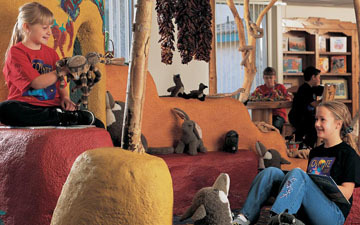 Cost: $20 per day (Pueblo Grande Museum 1 Year Family membership included when child is registered for all five days). Explore the Art of the Hohokam through the science of archaeology. Learn how the Hohokam used their desert environment to inspire their art, build their homes, make their music, and more. The schedule includes: The Art of the Hohokam (create your own Hohokam pottery and shell pendant) on Monday; The Art of Architecture (do sketches and build models of Hohokam structures) on Tuesday; The Art of Music (make and decorate your own instruments) on Wednesday; The Art of Movement (animals of the desert and their importance to the Hohokam, plus yoga) on Thursday; and The Art of Rock (petroglyphs and pictographs) on Friday. For more information, call 602-495-0901. Camp Innovation, hosted by the Arizona Science Center, offers 14 innovative programs in June and July designed to inspire every child ages 3-14. Children can explore engineering, LEGO® robotics, apps, film, art, weather, chemistry, sports, medicine, zoology, Egyptian science and more. Camps are designed to be age specific and early drop-off and late pick-up options are available to parents. Weekly sessions begin June 2. Cost per week varies based on age group and camp theme. The Arizona Science Center is located at 600 E. Washington St. Register online at www.azscience.org or call 601-716-2028. Young Olympian (Ages 3-5) — Get ready to compete, inquire, and enjoy a fun-filled week of sports science! Create and participate in a variety of Olympics-inspired events that will improve hand and eye coordination as well as increase their strength and flexibility, Camp Innovation style. • S.T.E.A.M. : Full Engines Ahead (Ages 3-5) — All Aboard! Hop on and enjoy the journey as we learn about trains incorporated with science, technology, engineering, ART and math together. Don’t let this train pass you by! • Walk Like an Egyptian (Ages 6-11) — Travel back to the days of the Pharaohs to discover the wonders of Ancient Egypt! Dig for artifacts, build a pyramid, record hieroglyphics, mummify your peers, and more when you journey to Egypt! • Chemical Meltdown (Ages 6-11) — Ever wondered what would happen when you mix two different chemicals together? Find out during this camp, as we test different substances to create cool chemical reactions! Just make sure you are not afraid to make a mess! • Survival Science (Ages 6-11) — What would you do if you were stranded in the wilderness without food or water? How would you survive? Discover how to conquer nature with science survival skills and be ready to take-on the outdoors and S’more! • Zoofari Ages (6-11) — Grab your khakis, binoculars and camera as we journey through distant lands and learn about the animals, their behaviors, and their amazing adaptations! From the depths of the oceans to the highest mountain tops, discover some unusual characteristics that allow animals to survive. • Renaissance: Great Minds Think Alike (Ages 6-11) — Discover the eruption of scientific and artistic advancements during the Renaissance! Design a cathedral, paint a Michelangelo masterpiece, print like Guttenberg, train to be a knight, and much more as you travel back in time! • Science of Film (Ages 12-14) — Enroll in Camp Innovation’s film academy and learn about the science behind special effects, lighting and sounds, 3D technology and many other aspects of filmmaking. Campers will also take a behind the scenes tour of our IMAX® Theater and get a close-up look at our current projection technology. • SWIFT Weather Camp (Ages 12-14) — SWIFT weather camp is a week-long educational program developed to engage and inform teens about the science of meteorology and related career opportunities. Campers will receive personal instruction from Arizona State University researchers and National Weather Service meteorologists in forecasting, observing and reporting all aspects of weather and climate. They will engage in hands-on activities, field experiments, seminars, tour of research facilities and workshops that expand their knowledge of atmospheric sciences, weather and forecasting and environmental instrumentation. • All Star Sports Science (Ages 10-14) — Discover the physics behind America’s favorite past time, baseball, in a very special sports science camp! Through exciting, hands-on activities, you will discover a bats sweet spot, determine whether or not a curve ball actually curves and why the Valley is perfect for year-around baseball. You will also learn how nutrition and personal fitness help players stay competitive. • S.T.E.M. Academy (Ages 12-14) — Have you ever imagined designing an indestructible road way from floods or find ways to improve visibility during dust storms? Solutions like these require an understanding of science, technology, engineering and math fields. Graduate from Arizona Science Center’s STEM Academy by developing solutions to some of Arizona’s biggest issues! • Alarming Apps (Ages 12-14) — Learn how to program and create an app for your mobile devices at Camp Innovation: Alarming Apps! Campers will utilize current programing software to experiment with the technology and programming needed to design and develop their own customized app. • LEGO® Robotics (Ages 12-14) — Stimulate your imagination by combining math and engineering. During this three day program campers will test various robotics, work in teams to build and program their own LEGO® robots, and compete in an Arizona Science Center robotics competition. • BMI @ Barrow Neurological Institute* — Experience a world inhabited by research scientists and neurosurgeons while learning what it takes to get a drug from the laboratory bench to a patient’s bedside. This unique opportunity includes hands-on lab work involving DNA extraction, gene transformation and protein purification. The experience features amazing tours and talks by scientists and neurosurgeons. Campers create PowerPoint presentations of their work that are presented to scientists, parents and friends. Coyote Summer Camp at the Pointe Hilton Squaw Peak Resort (submitted photo). Pointe Hilton Squaw Peak Resort (www.squawpeakhilton.com) in Phoenix will once again offer its popular Coyote Summer Camp program from May 19 to Aug. 1, for children ages 5-12. The resort’s Coyote Summer Camp Program offers several options for campers, including full day camp from 9 a.m. to 4 p.m. ($279 per week) or half-day camp from 9 a.m. to noon ($165 per week) or 9 a.m. to 1 p.m. with lunch ($200 per week). Led by qualified camp counselors who focus on education, entertainment and fun, each season of Coyote Summer Camp offers a new line-up of activities and programming. With programming developed in three-week rotations so that campers have new and exciting experiences, each week features creative activities like hands-on cooking projects, science experiments, and daily unique arts and crafts projects. Tennis and other fitness-minded activities are also incorporated into each week’s activities. Each full day of camp includes supervised swim and pool time at the resort’s four-acre River Ranch water park, which features a winding lazy river, waterslide, sport pool and more. Lunch is included for full-day and half-day campers who enroll in the 9 a.m. to 1 p.m. program, as well as morning and afternoon snacks. For enrollment in the 2014 Coyote Summer Camp, call 602-997-2626, ext. 4567. For more information on the camp and Pointe Hilton Squaw Peak Resort, visit http://www.squawpeakhilton.com/phoenix-resorts-for-families. Pointe Hilton Squaw Peak Resort is located at 7677 N. 16th St.
What do you say to a child grieving the loss of a loved one? Children grieve differently than adults and sometimes their grief process is misunderstood. Often, children learn best from other children who share their experience. Stepping Stones of Hope brings children and their families together to do just that … share their experience. Camp Paz is an overnight camp reaching out to grieving children ages 6-17 and their families to provide a neutral and safe environment where friendships are created and healing can take place. At Camp Paz, children learn they are not alone and realize their feelings are normal. Camp Paz for kids and Camp Paz for grown-ups takes place April 26-27 at Whispering Hope Ranch in Payson, Ariz. Cost is $50 per camper; registration fee includes lodging, food, activities and take-home items. Transportation is not provided. Partial scholarships are available. Register online at www.steppingstonesofhope.org or call 602-264-7520. 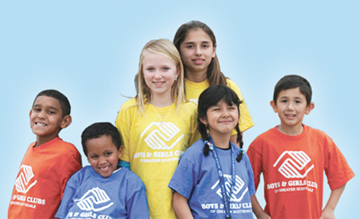 The Rosenzweig Branch of the Boys & Girls Clubs of Metro Phoenix, 2242 W. Missouri Ave., begins its Summer Day Camp registration on Saturday, April 12. The affordable summer camp programs provide kids entering first through twelfth grades with a full summer of activities and experiences. And, with the help of the USDA Summer Food Service Program, the club offers free breakfast and lunch. The Rosenzweig Branch has undergone several renovations, the most recent of which took place in 2004 and included the addition of a Teen Center complete with a Learning Center and half basketball court. Other amenities include an art center, game room and gym. In 2012, the Club served over 1,850 youths of northwest Phoenix with engaging, educational programs including partnerships with Homeward Bound and the Phoenix Police Department. Open registration is 9 a.m. to 1 p.m. Space is extremely limited. Summer sessions begin May 27 and continue through Aug. 6. Program hours are 7 a.m. to 6 p.m.
Average cost is $50 per week. For schedules and details on program costs and financial assistance, go to www.bgcmp.org and click on “Locations,” or call 602-249-1338. Desert Song instructors believe that practicing kindness starts early and children can be great ambassadors of kindness when it’s a part of their young lives. The yoga and health center offers a “Keep it Kind: A week of Cultivating Kindness” camp from 8:30 to 11:30 a.m. June 16-20. Children will learn how to be a superhero of kindness as they spend a week learning about random acts of kindness, both their own and those of others. Each child will create a set of kindness cards to extend goodness throughout his/her life. In addition, the yoga camp will include asana practice, techniques for fostering kindness, poses and games to boost confidence, and practices to generate cooperation and compassion. There also will be an array of books, games and activities. The camp is limited to 15 children and an application is required. Fee is $155 per child and must be paid in full at the time of registration. Desert Song Healing Arts Center is located at 3232 N. 20th St. To register, call 602-265-8222. For more information, visit www.desertsongyoga.com. Is your child an aspiring musician who loves to play a string instrument? Are you looking for an enriching summer experience for them? If so, consider the Phoenix Junior Strings Chamber Orchestra’s summer program in Central Phoenix. Auditions for violin, viola, cello and standing bass will be held on May 17. There will be multiple chamber groups, so players of all degrees of experience are welcome. Rehearsals, led by professionals with two decades of symphony experience, will be held Monday and Thursday evenings from June 9 through June 26 at Covenant Home School Resource Center, 1117 E. Devonshire Ave., just north of Indian School Road. The final concert will be June 27. Visit www.phoenixjuniorstrings.org for more information or call Patty Waxman, PJS musical director, at 602-908-2929. Each June All Saints’ Episcopal Day School, 6300 N. Central Ave., offers a four-week summer program with a wide variety of classes, some offered for enrichment opportunities and others designed to reinforce academic skills. Enrollment at All Saints’ is not necessary in order to attend summer school. Each class is one week in length, although parents may register their child for the same class, or different ones, for all four weeks (June 2-27). Offerings include: Greawt Hikes; Museum Madness; Minecraft; Pirates; Active Bodies; Cookie Favorites; Robotics; and more. Weekly sessions are June 2-6, 9-13, 16-20 & 23-27. Parents also have the option of building a partial-day or full-day schedule (8 a.m.-5 p.m.). Students who stay for a full day can bring a sack lunch and eat together in a supervised area. Snacks are provided in all four-hour classes. Costs vary per class. View the schedule online at www.aseds.org or call 602-274-4866 for more information. Brophy College Prep, 4701 N. Central Ave., offers an academic session for girls and boys entering sixth through eighth grades, and athletic sessions for boys and girls entering third through eighth grades. These courses begin on Monday, June 9, and end on Wednesday, July 3. The summer curriculum is designed to reinforce success and to challenge those students who already have a good grasp of academic and athletic fundamentals. Most classes are individualized to meet the diverse needs of students from different backgrounds. The summer academic program is designed to combine serious academic study with a relaxed social atmosphere. The Brophy campus opens at 7:30 a.m.; classes run from 8:15 a.m. through 2:30 p.m. Each academic course will be 18 days long. Cost is $225 for the first course and $150 for each additional course. 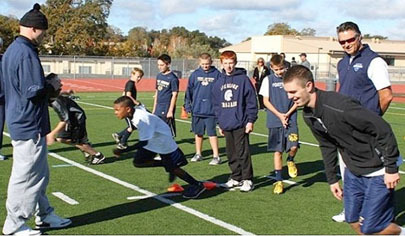 Young athletes participate in a receiver skills training camp put on by Receiver Tech (submitted photo). The athletic camps include Basketball, Baseball, Lacrosse, Wrestling and Soccer. Brophy will not be offering any enrichment classes, academic or athletic, to students who are entering the 4th grade or lower this summer. Camps run from June 9-20 and June 23-July 3. Cost is $200 for one class during one session, and $350 for one class for both sessions, and $650 for two classes during both sessions. For more information, contact Tony Oldani at toldani@brophyprep.org. For more information, call 602-264-5291, ext. 6444 or visit www.brophyprep.org. Seventh graders through varsity high school football players are invited to sign up for this receiver skills training camp, 10 a.m.-4:30 p.m. Saturday, June 28 at Phoenix Christian Prep, 1751 W. Indian School Road. Participants learn first-hand techniques of route-running and pass-catching that give them an edge and help them reach their athletic goals. The daylong athletic camp is limited to just 30 athletes. Register before June 22 and pay $155 per student. To register, go to www.receivertech.com. For more information, call 888-972-6554. Spend an exciting week with artists who teach drawing, painting, ceramics, 3D sculpture with found objects, duct tape, origami, silkscreening T-shirts, beading, fashion design and a whole lot more. artSpace Camp at the Shemer Art Center, 5005 E. Camelback Road, is from 10 a.m. to 3 p.m. in two sessions: June 9-27 and July 7-25. There are two classes offered each day. Shemer does not offer extended care. artSpace Camp is designed for children ages 9-13. Campers must pack a lunch and snack every day to eat during supervised breaks. Registrations are on a first-come, first-served basis. Space is limited to only 25 students per week. Enrollment is done online at www.shemerartcenter.org or by mail-in application only. Enrollment forms can be downloaded here: http://www.shemerartcenter.org/programming/youth-classes/. Payment and proof of age will be required upon registration. For more information, call 602-262-2747. A summer day camp for students that is entertaining, educational and will promote physical fitness will take place at Painted Rock Academy, 14800 N. 25th Drive. By combining a diverse range of activities children stay engaged and excited to learn. Campers are exposed to a vast range of activities and adventures. Drama, Art, Physical Initiatives, Dance and Cheer are included in the full-day program. Campers will also enjoy the game room and movie lounge. Fridays are Water Days. Children will enjoy fun water games and activities each Friday at camp. All sessions are two weeks. Sessions include: June 2-13, Junue 16-27, June 30-July 11 (no camp on July 4), and July 14-25. Options include a half-day (9 a.m.-12 p.m.) for $250; and full-day (9 a.m.-3 p.m.) for $350. Add extended day (add 3-5:50 p.m.) for another $150. Before care, from 7 to 9 a.m., is free. For more information, call 602-291-0242 or visit www.arizonainstruction.com. The North Phoenix Baptist Church Family Life Center Family Life Super Summer Bible Camp (SSBC) is a summer daycare run like a vacation bible school. SSBC is open Monday through Friday from 7:30 a.m. to 5:30 p.m.
Super Summer Bible Camp runs May 27 through Aug. 1. A typical day for children would include activities like craft time, organized gym games, table games, board games, Bible study lessons, memory verses, and roller-skating. Every week SSBC campers go on a field trip such as going swimming at Washington pool, bowling, the zoo, ice skating, the Science Center, and/or Flip Dunk (field trip fees extra). The cost of camp is $135 for the week or $31 a day. SSBC is a very flexible camp, you can bring your child one or two days a week or for the whole week depending on what your childcare needs are. Field trips and lunches are not included in the cost of camp. To register your child for SSBC, pick up a registration form at North Phoenix Baptist Church in the Family Life Center at the front desk, 5757 N. Central Ave.; or download the registration form off the North Phoenix Baptist Church website: www.nphx.org. REACH is a grief camp designed for teenagers between the ages 13-18 who have experienced the death loss of a loved one. This is one of the first camps of its kind and dedicated specifically to grieving teens. A traditional, fun, high-energy camp, REACH, focuses on activities to support self-discovery, enhance communication skills, build trust, and share in a safe environment. REACH is a weekend camp beginning on Friday, June 20 and ending late Sunday morning, June 22, at Spirit in the Desert Retreat Center, a beautiful desert campus located in Carefree, Ariz. REACH is uniquely designed to provide teenagers non-traditional coping skills needed to face the challenges of dealing with the death loss of a loved one. Registration fee is $50 and includes lodging, food, activities and take-home items. Partial scholarships are available upon request. Register online at www.SteppingStonesofHope.org. For more information, call 602-264-7520 or e-mail info@steppingstonesofhope.org. LEGO® bricks, the popular building toy, are the building blocks of intense creativity and design among adults and children alike. Bonanza Educational has partnered with the Heard Museum, 2301 N. Central Ave., to provide a one-of-a-kind summer program for children ages 7-13 with four components of fun based on the current exhibit BUILD! Toy Brick Art at the Heard. The one-week workshop will be offered four times in June: 2-6, 9-13, 16-20 and 23-27. Each session is the same. Each will be held from 8:30 a.m. to noon Monday through Friday. Seating is limited. Heritage Square, 113 N. 6th St. in downtown Phoenix, offers A Day in the Life summer camp for children ages 6-12 during June. Each day of camp the children will pretend to be a different person who lived in the historic Rosson House, such as: a Victorian girl, an adventurous boy, a territorial doctor, a wealthy housewife, and a young maid. They also will be given a fun and themed item to take home with them. Each day there are several activities the children can participate in lasting from 40 minutes to an hour depending on the age group. Activities include building a stethoscope, making jam and playing croquet. The cost of the camp is $175 per child and camp runs from June 16-20 for children ages 6-8. Children ages 9-12 can attend the second session, June 23-27. Both sessions run Monday to Friday from 9 a.m. until 4 p.m. The maximum number of children per session is 15. Register or get more information by contacting Lindsey Vogel-Teeter 602-261-8948 or go to www.rossonhousemuseum.org/education.